Six pairs of socks on a radiator. Soon I will be leaving my home of eight years. I've been trying to get stuff sorted out. Washing and packing things that I won't need or use until I find my new home. This kind of readjustment is difficult for everyone to deal with, I know. For a sensitive artistic type it's nervous breakdown material. I'm hoping that the turmoil will provide fuel for drawing. Instead of being a distraction. Yesterday I washed all my socks. Turns out I have over thirty pairs. How? Why? Because, I only ever where the stripey blue, the plain brown or the stripey brown ones. I don't think I've ever worn one of these six. Ever. Now that's obscene. I totally understand, I just moved a few months ago and didn't realize the obscene amount of socks AND underwear I had. Moving is the worst. The socks are great. They're so real that I took a pair and have been wearing them all day now. Your favs, those resting comfortably near the top of the "others" (the ones you don't wear) are provided a warm and cozy nesting place to rest before you put them on your feet, beat the crap outa them all day, then throw into the washer. Those that spend all their time in the drawer hold those resting atop the drawer in a respect we can only imagine. My bet is this six were terrified, shaking in their threads, while you kept them out of their drawer. doncha think? Well, this is so funny! When I moved here to this apartment. I had plenty of socks and underwear. Guess what? I am now in need of new socks and underwear. I quit purchasing those items because I had so many. Now, I am taking vacation in Turkey the 2nd week of Feb- gift from my son. Seriously, I have to purchase this items and soon. Down to about 4 pair each. Love the your colored socks. So, see you do not have to purchase necessities for awhile. I know about the stress of moving. I have had peace here since july of 2004 - seems incredible. Before that i moved like six times between 1999-2004. Cannot wait to here about the new place. Happy moving and all those new drawings. I'm utterly impressed by your subtle handling of the patterns on the cuffs. Still don't know how you achieve that in ballpoint and still suspect it is witchcraft. I'm a big fan of stripy socks! Were I a faster and better knitter, I would have made myself dozens of pairs of stripy socks by now. Good luck with the move Andrea. Here's something you can think about when you're overwhelmed with the transition to the new place: How do you make such everyday, humdrum items look so darn cool? 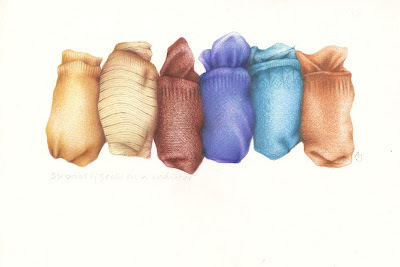 I want a sock drawing that looks this great. My Husband is a collector of socks, which is lucky cause our beagle is a destroyer of socks. This is such a realistic work. I love the colours and the shading. You've really managed to bring it to life. Hope the move isn't too stressful. Totally fascinated...as usual... with your delicate and subtle touches making the ordinary extraordinary...ahhhh! But you never know when they'll come in handy. Great choice of subject, impeccably handled as usual. LOVE these! How do you make such mundane stuff look so fantastic? That's such a cut picture. I have every sympathy for you moving - I've been 'meant to be' moving now for about 2 years and I'm dreading it. Hope it all goes smoothly for you. "Hey Andrea, dat is WELL cut like." 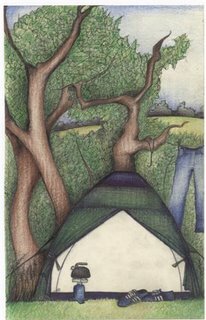 Andrea, wow, you blow me away with the subtlety and detail of your sketches! I so GET what you mean with moving being nervous breakdown material. May it be fuel for you, and open up new space within. Nice drawing, as ever. Amazing that so many socks didn't go to sock heaven but survived and paired to boot. We have now lived in the house we are in for nearly nine years. That's the longest we have lived in one location since we married 25 years ago. Best of luck with everything involved in your move. Lovely drawing - gorgeous detail and shading. Good luck in your house move! We will have to do it in the near future too I think, and the thought fills me with dread. the texture of the socks is beautiful, i just want to touch them and i really like the composition. One can never have too many socks. This is such an appealing drawing, Andrea, you do an amazing job of capturing the texture/softness of them! I love your socks! I still havent found out how mine get in my drawer, they seem to just 'appear'. Moving is big stuff - hope it goes well, keep drawing and make it an adventure! ps you won't be moving on your own you have a massive fan base moving with you! Can't wait for the housewarming!!! pps - word verification is scite - so 'sciting! I love your socks! I'm the same way. Own tons of socks but only wear certain ones!. Love the drawing. I've moved more times in my life than I care to think about but once all the sorting and dumping and packing are done I always feel so free and unburdened. Of course I immediately start to collect more "stuff". Good luck! You are so funny Andrea. I'm not even surprised about the socks. You did a wonderful job on them. Moving? wow, big job ahead of you. When you get settled let me know and I would love to trade MOOs with you. Oh, wow. Thanks, guys. I'm glad you like this one, beacuse it's one that I (finally) like too. Sherrie, I'm going to tackle underwear next. EJ, I'm buying a brand spanking new kettle to celebrate moving. The old one is a little worse for ware! Rachel, I've been 'meaning to move' for about two years, too. Hmmm, scary. And, yeah, I think that could really catch on!!! I am very 'scited about the move, terrified too. Thanks for all the well wishes too. I really do appreciate it. Really. What an appropriate way to introduce this move. A bunch of socks, all bundled up. They are so human. Your drawings always amaze me. Besides the cat bowls, now I have to count my socks too. I really like how you handle the colored pencils. Fabulous work!! You're moving? How traumatic. But also a good way to keep your stuff cleared out and/or discover stuff you haven't seen in a while. Thank you, guys. You make my day.